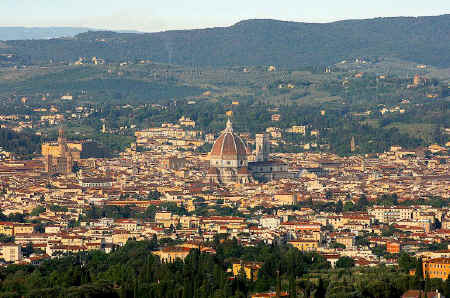 A day trip from Florence to Fiesole, Italy is a must for any visitor to this part of Tuscany, Italy. Aside from the sights of interest within and near Fiesole itself, on a sunny day the view from the Fiesolean hills out over Florence is spectacularly beautiful. 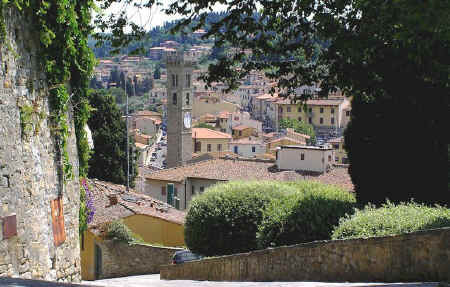 Fiesole can be reached by car or bus, and also (for the fit only) on foot along narrow walled roads past numerous fine villas, including the Villa Medici at Fiesole. Fiesole is of Etruscan origin, as may be seen from the remains of its ancient walls, and was probably founded in the 9 C BC. One possible reason for the prosperity of Etruscan and Roman Fiesole could be its location near a ford over the Arno close to where Roman Florence (Florentia) would rise. Fiesole's location also made it strategic for travellers on all the main roads between southern and central Etruria to the south of Italy (covering large parts of present day Tuscany, Umbria and Latium) and the Etruscans in the area around the Po valley to the north of Italy. Stay in the country and save money! 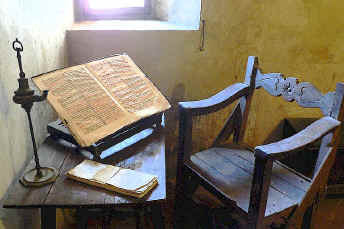 During your tour of the art cities of Tuscany, Italy, visit and stay in the Chianti countryside. Beautiful scenery, inexpensive food and wine, less-frequented art and architecture, authentic people. 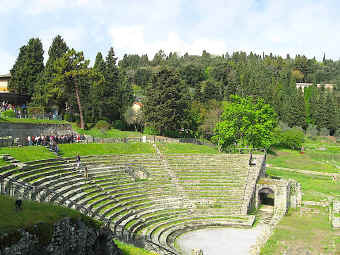 The Romans conquered Faesulae, as Fiesole was then known, in 283 BC. Under Roman rule, it became the seat of a famous school of augurs, and every year twelve young men were sent here from Rome to study the art of divination. Rome typically drew heavily on the Etruscans for priests and augurs. Sulla colonised it with veterans, who afterwards, under the leadership of Manlius, supported the cause of Catiline. Near Fiesole, the Vandals and Suevi under Radagaisus were defeated (405) by hunger rather than by the troops of Stilicho. A considerable number of interesting finds from the Etruscan period - urns, bucchero, clay and bronze statues - together with other objects from Roman times are to be found in the Museum near the archaeological zone. During the Gothic War (536-53), Fiesole was besieged several times and in 539 Justinus, the Byzantine general, captured it and razed its fortifications. In the early Middle Ages, Fiesole was more powerful than Florence in the valley below, and many wars arose between them. In 1010 and 1025 Fiesole was sacked by the Florentines, and its leading families obliged to take up their residence in Florence. 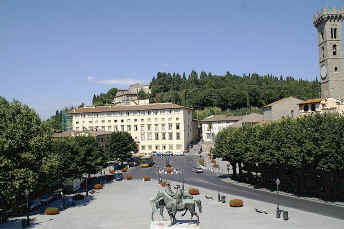 Christianity was introduced to Fiesole by St. Romulus, a disciple of St. Peter. The fact that the ancient cathedral (now the Abbazia Fiesolana) stands outside the city is a evidence that the Christian origins of Fiesole date from the period of the persecutions. The earliest mention of a Bishop of Fiesole is in a letter of Gelasius I (492-496). A little later, under Vigilius (537-55), a Bishop Rusticus is mentioned as papal legate at one of the Councils of Constantinople. The legendary St. Alexander is said by some to belong to the time of the Lombard King Autari (end of the sixth century), but the Bollandists assign him to the reign of Lothair (middle of the ninth century). A very famous bishop of Fiesole was St. Donatus, an Irish monk, the friend and adviser of Emperors Louis the Pious and Lothair. He was elected in 826 and is buried in the cathedral, where his epitaph, dictated by himself, can be seen. The numerous locations and churches incorporating his name, San Donato, provide evidence of his influence and popularity throughout Tuscany. He founded the abbey of San Martino di Mensola. 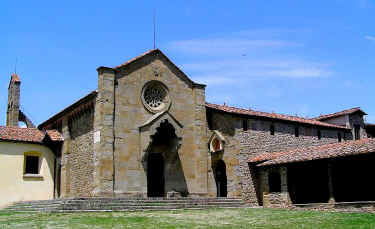 Bishop Zanobi in 890 founded that of St. Michael at Passignano, which was afterwards given to the Vallombrosan monks - Badia a Passignano. Other bishops were Hildebrand of Lucca (1220), exiled by the Florentines; St. Andrew Corsini (1352), born in 1302 of a noble Florentine family, and who, after a reckless youth, became a Carmelite monk, studied at Paris, and as bishop was renowned as a peacemaker between individuals and States. He died 6 January, 1373, and was canonised by Urban VIII. Other famous bishops were the Dominican Fra Jacopo Altovita (1390), noted for his zeal against schism; Antonio Aglio (1466), a learned humanist and author of a collection of lives of the saints; the Augustinian Guglielmo Bachio (1470), a celebrated preacher, and author of commentaries on Aristotle and on the "Sentences" of Peter Lombard; Francesco Cataneo Diaceto (1570), a theologian at the Council of Trent and a prolific writer; Lorenzo della Robbia (1634), who built the seminary. Among the famous natives of Fiesole is the painter Lorenzo Monaco (1370-1424). But the greatest name associated with the history of the city is that of Fra Angelico, Blessed Giovanni Angelico da Fiesole (1387-1455). His baptismal name was Guido, but, entering the convent of the Reformed Dominicans at Fiesole, he took the name of Giovanni in religion; that of Angelico was afterwards given to him in allusion to the beauty and purity of his works. Aside from the numerous famous works of Fra Angelico himself and his followers, paintings from the school of Fra Angelico may be seen among other places in the Church of Santa Croce in Greve in Chianti. The Cathedral of St. Romulus was built in 1028 by Bishop Jacopo Bavaro with materials taken from several older buildings and it contains notable sculptures by Mino da Fiesole. The old cathedral became a Benedictine abbey, and in course of time passed into the hands of the regular canons of Lateran. It once possessed a valuable library, long since dispersed. The abbey was closed in 1778. The famous Vallombrosa Monastery is within the Diocese of Fiesole although not near the town. The writings of Giovanni Boccaccio da Certaldo indicate that he felt the slopes of Fiesole to be a delightful place and the ideal setting for his narratives. Since Renaissance times this countryside, celebrated by Poliziano and frequently visited by Lorenzo il Magnifico and the Pico della Mirandola, has been chosen as the country seat of well-to-do families, Florentine and later foreign, whose splendid homes and villas remain much in evidence today. After the second half of the 19 C, during the brief period when Florence was the capital of Italy (1865-70), many additional fine residences were built in and around Fiesole. 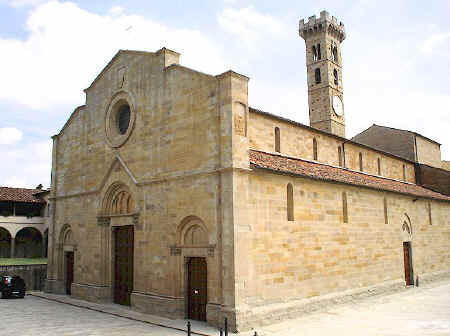 the Cathedral of Fiesole (Il Duomo), containing the shrine of St. Romulus, martyr, according to legend the first Bishop of Fiesole, and that of his martyred companions, also the shrine of St. Donatus of Ireland. 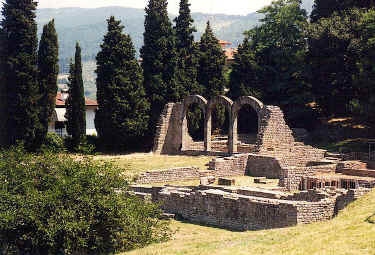 the Badia or ancient cathedral at the foot of the hill on which Fiesole stands, supposed to cover the site of the martyrdom of St. Romulus. the room in the bishop's palace where St. Andrew Corsini lived and died. the little church of the Primerana in the cathedral square, where St. Andrew Corsini was warned by Our Lady of his approaching death. 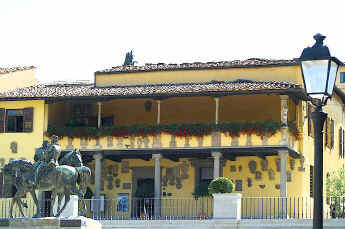 S. Girolamo, the home of Venerable Carlo dei Conti Guidi, founder of the Hieronymites of Fiesole (1360). S. Domenico, the novice-home of Fra Angelico da Fiesole and of St. Antoninus of Florence. The roads that lead from Florence to the hill of Fiesole all converge on the plateau where the church of San Domenico stands, annexed to the convent which was founded in 1406. The Renaissance layout of the building was transformed between the end of the 16 C and the beginning of the 17 V by Dosio (tribune and choir) and Matteo Nigetti (porch on the facade and bell tower). The complex contains a wealth of works of art: outstanding among them are various paintings by Fra Angelico, whose novice home it was. St. Antoninus of Florence, Bishop of Florence in the first half of the 15 C, also stayed there, as well as Fra Domenico Buonvicini who was burned at the stake with Savonarola in 1498. Fontanelle, a villa near S. Domenico where St. Aloysius came to live in the hot summer months, when a page at the court of Grand Duke Francesco de' Medici. A few miles distant is Monte Senario, the cradle of the Servite Order, where its seven holy founders lived in great austerity and were cheered at their death by the songs of angels - or so some believe. S. Martino di Mensola, with the body of St. Andrew, an Irish saint, still intact. Villa Medici at Fiesole - more about this archetypical Tuscan villa. On the other side of the valley of the Arno is the beautiful romanesque church of San Miniato al Monte. Over three million antiquarian books and rare books listed for sale by independent booksellers world wide. No price markups. 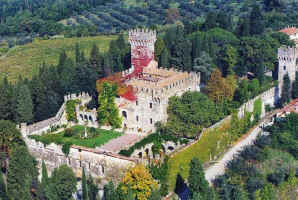 North of Florence on a hill next to Fiesole, the Vincigliata Castle is of medieval origin but owes its current appearance to the complete reconstruction in neogothic style that was carried in the last century. The owner at that time, John Temple Leader, commissioned the architect Giuseppe Fancelli to rebuild the castle and the work was finished in 1865.More about Vincigliata Castle. Vorresti pubblicizzare la tua attività su questo sito web per Fiesole e ricevere traffico in entrata dalla nostra rete di più di 50 portali relativi? Clicca qui per ulteriori dettagli in merito alla nostra soluzione integrata per una presenza su internet piena di successi.